Marin Alsop Interview with Bruce Duffie . . . . . While each of us on the planet is unique, those who are in certain professions need to have minimum amounts of prescribed abilities. These requirements are determined by necessity and expedience. Leaders of those professions must have more skill-sets plus the added responsibility of being able to encourage and guide others. Conducting musicians takes this even further, and rising to the top of this arena remains elusive and mysterious. There is no obvious instruction manual, and yet just about everyone has strong opinions about what it takes to make it both small and big. Marin Alsop has spent her lifetime ascending, and now is part of that rare group of recognized achievement. Having led many orchestras over the years, her current position is that of Music Director of the Baltimore Symphony. More details about this as well as her history can be found in the box at the bottom of this page. Suffice it to say she has arrived and is among the select group at the top. Alsop was full of energy and even as I was setting up the machine to record our conversation, she asked if I was ready to roll. I pushed the button and we were on our way . . . . .
Bruce Duffie: Are you always ready to roll? Marin Alsop: Yes, pretty much. BD: When you come to rehearsal, do you have to be completely ready to roll? MA: Oh, absolutely. As soon as you hear that A, it kicks you into gear. It does for me, anyway. The tough part is when you have to fly all night, get off the plane and go right to rehearsal. You just have to get energized immediately. BD: Will you have spent some of the time on the plane reviewing the score, or will you have spent time just resting your body? MA: It depends on how long the flight is. [Laughs] Usually when I go overnight to London, I really try to catch some sleep so that I’m pretty fresh if I have to go directly into rehearsals. But otherwise, coming here, for example, until we hit a very, very bad patch of thunderstorms, I was looking over the scores. BD: Is it easier going east to west or west to east, or does it matter? MA: To me it’s all the same. It makes it easier if you go to sleep and wake up there, so west to east is easier for me. BD: I always find lengthening the days is better than collapsing. MA: None of it’s very good, but I just ignore it and it seems to work for me. BD: When you come to rehearsal, you have in your mind what you want to do. Is all your work done at that rehearsal to get it right, or do you leave something for the spark of the evening? MA: It depends on the orchestra. With an orchestra like the Chicago Symphony, obviously there’s a huge range of things that you can really leave for the concert because you trust them. They know what they’re doing. They have this innate sense of what to do at the concert, to turn it on, and so you don’t want to beat them over the heads about things. It just becomes pedantic and annoying. There’s a delicate balance of fixing enough things, or even saying, “Maybe we’ll tune that tomorrow,” like you’re not even going to do that today, but if you mention it, it becomes part of their consciousness, so they immediately take care of it. A lot of it is psychological. BD: Is it different preparing for a festival situation, where you have less time than a regular season when you have more rehearsals? MA: That is a very, very different rehearsal technique that one needs. All the works that I’m doing during the Ravinia Festival are works that I’ve done in subscription concerts with four rehearsals. It seems a luxury to have that kind of rehearsal time. It almost makes it easier in a way, because I know where the tricky spots are. I know what will come along in the concert already, so I feel that I can really cut corners very easily because twenty-twenty is good, especially when you have it before hand! MA: Yes, and it was interesting because on the break I was talking to some of the musicians. They hadn’t played in about eight years, so it’s a distant memory, but it comes back. They told me they would get to a part and say, “Oh, yeah, I remember this now.” So, it’s a matter of really going through and just reminding them. Actually there are several spots that I conduct differently from Barenboim, who did it, I assume, the last time, so we had to get that organized a bit. But this is a piece that I’ve done many, many times, so I know the parts. With new pieces, often the way the parts are laid out and the way it’s written is sometimes confusing, and that’s indeed the case with this symphony. So I know which areas are the tricky areas, and I can tell them, “I know the parts are confusing there, but this is what happens.” So you can almost cut to the chase and not waste too much time. BD: What about doing a brand new piece in a non-festival situation? MA: Then it’s a matter of really taking it apart and explaining exactly what’s going on. The fortunate thing here is that they have a familiarity with John’s written language. His notation is unique to him, and when you have to start from scratch with an orchestra on a piece like that, the notation is a little bit outside of the usual box. So you have to say it once and then they have to ask you, “What does that mean?” even though you’ve just said what it means! There’s sort of a natural number of times. It’s very interesting with a large group of people that one has to say things in order for everyone to get it. BD: Do they want to know what it sounds like before they have to make it sound like that? MA: Trying to give a little bit of a metaphor, a little motivation is always helpful. Especially when it’s a piece I’ve done, I know what people will tend to do. For example, in the very opening it needs to just be one note, an A, but the way it’s written, suddenly the strings are playing open Ds and other things because it’s the way the part is written. So if I say, “The opening is just As and this is what needs to happen,” then it helps move it along a little bit. BD: You have done quite a number of new pieces and you’re very much in favor of the American composer and the living composer. BD: Do composers then flock to you, hoping that you will do their music? MA: They do come to me and I welcome that. I encourage composers to send me music and to come and speak with me a lot. There are particular composers that I feel a tremendous affinity towards. John Corigliano is one of them, Christopher Rouse is another, as is John Adams. They’re all very, very close friends of mine and I do a lot of their music. So as soon as they have anything new, they immediately have their publisher send me a score and it gets to the top of my hit parade. But for emerging composers, I have to say I listen to absolutely everything I get, or have at least a cursory look. It’s a small percentage, but I have actually programmed pieces that I’ve gotten like cold calls, unsolicited. I thought, “This is a really good piece. Let me give it a try.” I’m in the very wonderful position of having a contemporary music festival in the summer in California — the Cabrillo Music Festival. Lou Harrison was one of the founders. He was just the nicest guy. We got pretty close and I did quite a bit of his music out there. Dennis Davies was there for eighteen years, and when they were looking for somebody new, he rang me up and said, “I think you’re perfect for this.” I’ve been there twelve or thirteen years now. It’s two weeks of contemporary music, so composers know that that’s a forum and a venue where they can really be heard and seen, and many of the composers come out. This summer we’ll have nine composers with us, and I’ve started a seminar, sort of a workshop for not only young conductors but also young composers. By young, I mean emerging. I hate this age limit thing. You could be eighty and be emerging, in my opinion. [Both laugh] So that’s added a new component for composers, and it’s wonderful because they get to hear the orchestra read their pieces. A mentor composer — this year it’s Michael Dougherty — will help them with different ideas, and then we do a little concert. We are trying to create opportunities for people to play and hear new music, and the audience out there comes because they love new music, which is a bit unusual in this day and age. BD: For either the established composers or the brand new, emerging composers, what is it that you look for? What is it that makes a piece really, really good, and resonate with you? MA: That’s a very personal thing, and I can only speak from my point of view because I have a very eclectic taste, but it’s also probably quite defined taste. I like to look at a score that has a very distinctive vocabulary. It doesn’t remind me of Copland or other composers. It’s not derivative, but it could have hints of these things in it. When I’m looking at an original voice, I need to hear someone that has a particular vocabulary, a signature that’s almost their own. Of course, with young composers that often has not developed yet. BD: That usually comes with experience? MA: Right. That is true of all composers. Even Brahms before the Hungarian influence was a little bit struggling. I think the same thing of Bartók when the folk dances came in. With John Corigliano, this blending of different worlds that he does is really a signature of his music; also Chris Rouse. Even though many of these composers write in different styles, I can look at one page of a score and tell you immediately who it is, or hear just ten seconds of a piece and know immediately that’s this person, even if it’s stylistically very different from other things they’ve done. BD: Is this something that the audience should be able to discern, even on first hearing? MA: The experience for the listener needs to be an emotional experience, not necessarily, “Oh, that was interesting,” or, “Oh, that was different.” Above all, music is an emotional journey. It takes you from one place to the other, and the listener and the performer — everyone involved — should be changed in some small way or some major way. If a piece does that for me, then I’m into it, even if it might have rough edges. BD: Are you conscious of the people who are behind you each night when you are conducting? MA: Oh, definitely. Our audience members don’t realize how critical they are to the concert experience. They’re really like that final dimension. Music does not come to life until the audience is there and we have the experience of sharing it with them. They’re critical to every performance — to the mood, to the concentration, to the focus, to the excitement, to the thrill. BD: So even in a rehearsal situation where you are playing the piece, it’s still not music if there’s no one there? MA: It’s music, but I don’t think it’s a complete experience until the audience is present. We don’t give our audiences enough credit and excitement; we don’t thrill them enough with this knowledge of how important they are to the performance. Every musician will tell you that. They say, “Oh, that audience was fantastic, weren’t they? You could hear a pin drop! They were so engaged,” or “God, that audience was so noisy tonight. They were distracted.” It makes an enormous difference! Or if they were screaming between the movements, I love that. I want people to be engaged in some way, and not experience classical music as something in the background or something to relax to. That makes me crazy when people say, “Oh, yeah, I put on classical music when I want to relax.” [Both laugh] I can sort of see why they say that, but I want people to be moved out of their comfort zone into a place where they are gripped emotionally; that their heart will look inward — whether it’s through pleasantness and joy or through real agonizing tragedy. I think they should walk out of the concert hall and feel differently than when they walked in. BD: When you’re building programs, then, is it your responsibility to make sure that there are some pieces that make them happy, and some pieces that make them think, and some pieces that create other emotions all in the same program? MA: I do think so. That’s what creates great programs, and to also try in some measure to have a story to the program even if it’s something quite abstract. I’m thinking of these particular programs that I’m doing here — the Brahms Double Concerto and then the Saint-Saëns Organ Symphony. It’s very interesting because it’s all about passion and outward expression; very, very extroverted. I thought of Nadja playing when I was building this program — since I knew she was going to be one of the soloists — and she’s so on fire. And the Saint-Saëns, too — the end of that is just, as we say, “Over the top.” So people should walk out feeling liberated in some way. They should say, “Oh yeah, I feel I just want to do something different tonight after the concert, something I haven’t done in a long time.” Every program has to have some kind of emotional pay-off in the end. BD: From this huge array of literature that exists and the literature that is just coming, how do you decide, “I want to do these pieces; I don’t want to do these pieces,” and then spread them over your concert season? MA: I know; it’s true! I am, too, some days, but that’s what makes it fun, that things are always changing and always fluid. BD: You don’t have to mention any specific names, but are there works that at this stage in your career you’re longing to do and you hope you get a chance to do? MA: I feel in the very fortunate position of being able to do almost everything I want to do. My career at this point is so marvelously full, and for me that means I’m able to do lots and lots of the standard repertoire, including all the big works like the Mahler symphonies. That’s the conductor disease. As soon as you do one Mahler symphony, you’ll want to do a bigger one! Bigger, bigger! And Right of Spring and all of these cast-of-thousands kind of pieces. But I am also able to do a lot of contemporary music and unknown composers through this festival I have. Then there are the other interests that I have, of course, like a lot of conductors, which includes doing opera. I’m able to work in a production about every year or every two years. Next year I’ll be doing Nixon in China with St. Louis, and I’ve been able to do some interesting things in concert, with semi-staging of opera and things like that. I’m really just thrilled with the range of what I’m able to do. Sometimes it feels as though being an American conductor and being interested in American music, there’s the sense that people want to put you down that road. So when you suddenly say you are dying to do Brahms’ One, they think, “You’re American; you do American.” They want to type-cast you. Luckily I feel fortunate in not having to play that role too much. BD: You want to be a virtuoso conductor of all the repertoire? BD: [With a slight nudge] You mean you like things in tune??? MA: Well, you know, the first time you hear it you think, “Oh my God, what happened?” But as soon as you adapt to that sound world and the way the music’s being projected and the phrasing and the leading from the bass line, it opens up a whole other realm. So I’m getting even more curious about that, but maybe once a year is good. MA: That’s a great joy. The sorrow is that the human voice is extremely delicate, so as soon as you start working with singers, you’ve got problems all the time. [Both laugh] Opera’s the fun part because it’s never the same people on stage two nights in a row; every night is something new. But the joy is hearing a phrase naturally projected when someone has a gorgeous voice. Think of someone like Renée Fleming. I can name you so many singers that I adore listening to because it’s so unaffected; it feels so natural, and that’s what music really should be. BD: Is this what you look for when engaging a singer — or an instrumental soloist — someone who performs naturally? MA: Yeah, so that it feels organic. Even if their interpretation may differ from anything I’ve heard, if it seems organic and feels organic unto them it will be engaging to the listener. The only time I’m not interested is when things seem contrived and maybe overly studied and overly analyzed, or trying a little too hard. Do you know what I mean? MA: There’s nothing worse than predictability, probably, right? There is such a difference between predictability and organic thought because organic you’re not really thinking. It just feels right. With predictability you’re saying, “Oh, yeah. He’s going to take time here, or oh mm-hm, mm-hm.” You knew that was coming. BD: But you don’t want a reviewer to say the conductor wasn’t really thinking tonight! BD: Then coming back really to one of my original questions, when you come into a rehearsal, how much have you thought about and organized your ideas, and how much do you let grow organically? MA: My approach is that it’s like giving a speech. I work it all through. I write it out; I go over it; I feel confident in the story of my speech. I have a beginning, I have a middle, I have a closer. I know what’s going to happen, and then I never look at the paper again. I go in and I just speak. For me, conducting is the exact same thing. I probably am overly prepared in some ways. I go over things. I love to study! It’s the joy of my life. I love going back to pieces for the second time. I love seeing a piece for the first time. BD: Do you like going back to pieces for the twentieth time? MA: I love it because you have a new insight and you’ve had all this new experience! It’s so important to look at a piece freshly and with a new point of view. For me it’s not just the studying. I think the physicality of it. I try to think it through, really work it out, and then, ultimately, I almost throw it all out. You walk on the podium and then you try to do what feels natural, but if you’re not really prepared, nothing feels natural because you’re simply unprepared. So I try to be overly prepared and loose at the same time. It’s a fine line to walk. BD: You have a lot of things in your bag of tricks to be able to call on whatever you need? MA: Yeah, boy, you have to. One of the great things about conducting is that you haven’t a clue what’s going to happen, really. You have a sense, and of course the more experience you get, the more of a sense you develop. But every orchestra is completely different. Their strengths and their weaknesses are completely different, as is their sense of rhythm and their sense of producing sound. Where are the pizzicatos going to be? Every orchestra is completely different, so one has to constantly adapt but constantly lead. It’s a mental challenge, it’s an emotional challenge, and most importantly the challenge is to connect with people and be in the moment, to be present and have an experience that is true in that time. BD: Is it safe to assume that where you are Music Director you do more leading, and where you are a guest conductor you do a little more adapting? MA: I would say so. The difference for me between being Music Director and just being a guest conductor is that I have a greater responsibility to my orchestra. I constantly push the bar a little bit higher every time. When I leave them I know exactly where I’ve left them, so when I come back, my expectation is that they’re going to start pushing themselves higher and higher as well. When you’re guest conducting, you know you’re there just a week every two years or so. Hopefully you see that same kind of improvement in an orchestra, but it’s not my responsibility. Even though I would say that I try to be genuine and demanding in a way that’s hopefully inspiring, I don’t feel the same; I don’t feel that I have to shoulder the same responsibility. BD: Do you take some of the tidbits you learn in other cities back to your own orchestra? MA: Oh, absolutely. Always, and particularly when I play with orchestras that have a very defined sound — especially when I work with foreign orchestras. I work a lot in Germany or in France where they have very different kind of woodwind playing. These are all valid approaches, and sometimes I like to try to incorporate those into my orchestra. In America our orchestras are so technically fabulous. We must easily have the greatest orchestras in the world. They can play on your beat, but they can also play late. In Germany they just play late. That’s life because that’s the kind of sound they’re going for. It’s a different approach, and so it’s fun to play with these ideas with my own orchestra. BD: When you come to an orchestra that you’re guest conducting, is there a lot you can do, or do you just want to work on your own specific program? MA: I mainly focus on my program, rather than talking too much. I do talk about sound, though, and mood and things like that. BD: So you are trying to shape them? MA: I guess I am. I’m a control freak, no matter what. Even when I’m not being a control freak, I am, but I don’t think that’s what it is. It’s a matter of wanting to shape the sound for that particular piece. When we play Saint-Saëns or when we play Beethoven, they both have different kinds of sounds. BD: Is it right to expect even the most virtuoso orchestra to be able to play all these styles, and all these periods? BD: Is it wrong of the audience, then, to expect every night to be a world record? MA: I think not. If you’re Marion Jones, you have to be Marion Jones every day. That’s the thing. When you’re the Chicago Symphony, you’re the Chicago Symphony every day, and that carries a big responsibility for the individuals. It’s not a big responsibility for a guest conductor. It’s sort of a big thrill, and you feel, “I’m driving a Rolls Royce today; that’s really cool.” [Both laugh] When you come with that expectation, they come up to meet you at that place that you set. “Oh yeah, I remember you. You’re up here,” and they just immediately jump to that place. BD: I usually ask this of composers, but since you do so much new American music, is it wrong of the audience to expect every new piece to be a masterwork? MA: That’s a good question. Probably. We have to give the composers that we love — or even those that we don’t love — some kind of latitude because they are human. There are pieces that are more inspired than others, but that doesn’t take anything away from the validity of every piece that a composer writes. It’s like reading all the books by someone and then you say, “Well, the one I just read isn’t as good as—.” Does that mean that that book wasn’t really as much of a masterpiece as the previous one, or does that mean that the reader didn’t connect with it as much? Perhaps a piece that wouldn’t strike me as being as much of a masterpiece as the last piece that someone wrote might strike the next person. To me, something needs to be well done and sincere and authentic. For me, everything in life is about authenticity and connecting and being genuine. I give people a lot of time if they’re just true to themselves and open and not shut down. If music is like that, even if it’s a little rough around the edges, for me it’s successful. But that’s a hard question to answer. BD: I’m very glad that you are one who champions a few composers. Because you are working with several of them, what advice do you have for these composers, or composers in general, who want to write for the orchestra today? MA: I think that they should always be open about what kinds of sounds are still hidden to the audience, that haven’t been explored. It thrills me to no end when suddenly a composer comes up with a coupling of instrumentation, or a method of playing that no one’s really thought of for the orchestra. That’s hard to do in this day and age, but I see this happen over and over with some of these composers that I champion, and it thrills me to no end, because it makes me realize that they’re listening with their imaginations, not being trapped in the particular sound world of today or yesterday. They’re always dreaming, and that, to me, is so important. For young composers, I think the key is really to try to get out there, just like young conductors, and get some experience. You have to become adept and facile and comfortable with this huge instrument, which is the orchestra. The first time out it’s not going to work so well. This goes for young conductors, too. First time out it’s usually absolutely a disaster; certainly my times out were! [Both laugh] But you try to learn from each experience and build on it. The learning curve is huge when composers are just breaking through and developing a vocabulary for the orchestra. Just think of the kind of evolution in Chris Rouse’s music or John Corigliano’s music. He grew up around the orchestra, so I think it’s a little bit different for him, but just never give up. This is my one mantra — just persevere at all costs. BD: You’ve made some recordings. Do you conduct the same in front of the microphone as you do in front of the audience? MA: There’s a good question. I’ve gone through different phases with recording. I come from a background as a violinist from doing a lot of studio work. I used to do a lot of jingles and films playing fiddle. That’s a very sterile kind of music-making. You’re wearing headphones and you have got to play to the click. Originally when I started making recordings, my approach was a little bit sterile in that I wanted everything to be perfect because it was going to be on a disk. Then gradually I’ve gone to a bit of the opposite extreme. When I recorded a Tchaikovsky disc live, we did a patch session, but we didn’t just record the whole piece again, which you often do in the patch session! I felt that I had gotten too separated from the sweep and the inspiration and the architecture of the piece by doing things in a segmented way. Now I feel that the place I’m at with recording is a happy place, a happy medium where I’m trying to get a big picture — depending, of course, on the difficulty of the work — to get things as right as one can. But perfection is no longer my goal in recording; it’s the same goal I have now in live music, which is that the emotional impact is more important than a slight noise, or maybe a slight human error, because the great thing about live music is that it’s human. It’s never going to be the same twice. 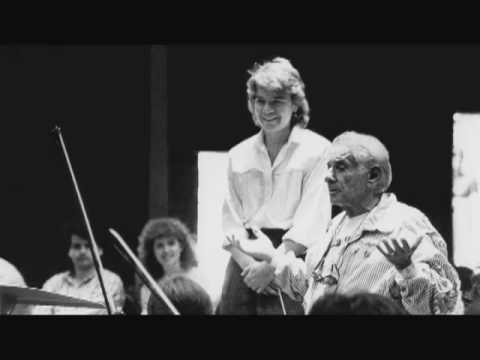 Of course, once you put that on the CD, you feel, “Oh, it has to be perfect because it’s forever.” Some of my favorite CDs are Leonard Bernstein, who I studied with, [photo at right] but life would not be the same for me without him groaning on those CDs and feeling that human part. That’s part of my aural memory, now. When I come to certain places in pieces, I can hear myself groaning just as I do when I listen to those recordings from so many years ago. So it’s like everything in this conducting world, and that’s probably what the great joy is. It’s constantly changing, constantly evolving. It’s very important to have a good relationship with one’s producer and engineers, and that’s a whole other element where you need to trust them and not just rely on myself. When the guys tell me, “We got that. It’s perfect,” or, “I don’t need that again,” I just trust them now. It’s as good as I can get it. I have two producers that I work with at Naxos and I love them both; very different styles, but they both are terrific. BD: You don’t aim for perfection, but without mentioning a specific time — if it ever existed — was there a night that everything went just right? MA: In live concerts? Oh, sure! Well, never everything. That would ruin it. But certainly there are those concerts where you feel — to use a sporting analogy — everyone’s in the zone. It’s like a group trance. We are all so totally focused that there is nothing else exists. It’s like riding the biggest wave around. MA: Yeah, and everybody feels it. “Wow, that was cool.” It’s interesting because it’s a complete loss and complete presence of ego. Everybody feels it and says, “I was great,” but it’s not that kind of egotistical where “I did great and we did great together.” That’s an interesting place to be because some nights you hear people talking, “Oh, last night was much better for me,” or “Tonight was much better for me.” But at those special concerts where everything clicks, you have the sense from everybody that everybody was totally on and it didn’t matter. BD: Are you at the point in your career you want to be now? MA: Oh, I think so. I grew up in a very, very competitive atmosphere, and was very ambitious. My parents are both professional musicians, so they wanted me to be a musician. I played piano when I was two; it was ridiculous. I had a job from birth. I think I’ve finally graduated from that feeling of run, run, run to the next rung on the ladder. I’m so happy doing what I’m doing right now that it’s a matter of living in this moment. I have the opportunities to be the best musician I can be right now, and that’s all I ever ask for in life. So I feel quite content. BD: Are you optimistic about the whole future of music — both performance and composition? MA: Oh yes. I’m extremely optimistic. It’s interesting because when we go through difficult times in this industry, the questions arise, “Is classical music going to survive? Is the symphony orchestra going to survive?” All these very ominous questions pop up at those moments, and to me these difficult times are when people have to reassess what they’re doing, how their organization functions, what kind of excitement we’re bringing to the live concert, and how we’re mixing things up. These are the times that are really the defining moments for any business, for any industry, and these are the moments of great opportunity. Rather than everybody being frightened, “Oh, it’s never going to be the same,” it’s like this is a great chance for us to reassess what we’re doing, and see what we’re really about. BD: Take off in a slightly different direction? MA: Yeah, and sometimes there are two choices at that junction. One can hunker down and become more staid and more conservative, or one can actually take a couple of chances that you haven’t been willing to take before because it was too comfortable. I tend to gravitate towards those organizations, those orchestras that are interested in taking a chance. Let’s try something different. Let’s do concerts at a different time. Let’s talk to the audience. I like to talk to the audience. Let’s do things like this. Then that develops into a whole series, a whole defining image, or how you present concerts and how you get kids interested. I want to rescue musicians — people that maybe played in high school and now are in their mid-forties or mid-fifties. I want them to dig up an instrument, or let’s find some for them and make orchestras of these people. We’ve gotten separated from just playing music for fun. BD: We’ve started that in Chicago with the Do-It-Yourself Messiah. Just bring your score and come and sing. MA: That’s great. I bet it’s extremely popular, isn’t it? BD: Sure. They have to do several performances of it. MA: People love it. That is an idea. It’s a matter of connecting people together. I feel these times are more of an opportunity rather than a disadvantage. BD: You have made some recordings with your orchestra in Colorado? BD: You champion many American composers. Are there a few non-Americans? MA: I get a few non-Americans in there. I’ve had James MacMillan, the Scottish composer. BD: He did a work for Evelyn Glennie. MA: Yes. I like his music a lot, so I’ve done quite a few of his things and he’s been out there. I’ve done some of Einojuhani Rautavaara and a few others. I’m more familiar with American composers because I spend more time in America. But now I’m starting to really embrace some of the living British composers. I’ll be doing a couple of pieces by Thomas Adès this summer. I haven’t met him yet, but at least I’ve met his music, which is very good. Another big piece that I love to champion is the Bernstein Mass, which isn’t done very often. BD: Will you be back for the Ravinia Festival next summer? BD: Do you like being booked a year, two years, three years, four years in advance? MA: I do. It gives you pause now and then, though, doesn’t it? BD: I talk to a lot of opera singers and their books are five or six years in advance. That’s almost too much, really, to get locked into. BD: Do you ever get to the point and wonder why you agreed to do this? MA: Luckily I have people now who are really trying to shape my career in a certain way and head in a certain direction that feels really on track for me. MA: Right. I’m embarking on a big recording project with the London Philharmonic. I’m doing all the Brahms symphonies and overtures. That was something I wanted to do. BD: I’m sure this is a question that you will be getting a lot, but why? MA: It does seem a little bit self-indulgent, doesn’t it, when there must be forty recordings of Brahms out there. MA: At least. Maybe a hundred forty. The opportunity arose because my record company, Naxos, is interested in doing a new cycle, and Brahms is a composer that I feel extremely passionate about. He’s really close to Chris Rouse for me. When you feel that kind of connection and commitment to a composer, whether everybody else feels it too, why not go for it? Hopefully I’ll bring some new point of view — if there is a new point of view to be brought. At least I’ll bring my own point of view. Also we have opportunities right now, in terms of the sound of recording, to do some things that haven’t been done — such as a Brahms series in surround-sound, in a sound that is just enveloping, which I think it should be. The listener will get that kind of feeling of being just covered in the sound of the orchestra because you’re right in the middle of it. That’s another opportunity that hasn’t been really explored enough yet. So that’s why. There it is. BD: I wish you lots of continued success with that. Thank you for speaking with me. MA: Oh, my pleasure. Thanks for having me. Hailed as one of the world's leading conductors for her artistic vision and commitment to accessibility in classical music, Marin Alsop made history with her appointment as the 12th music director of the Baltimore Symphony Orchestra. With her inaugural concerts in September 2007, she became the first woman to head a major American orchestra. She also holds the title of conductor emeritus at the Bournemouth Symphony in the United Kingdom, where she served as the principal conductor from 2002-2008. Her tenure as the BSO's music director has garnered national and international attention for her innovative programming and artistry. Musical America, who named Maestra Alsop the 2009 Conductor of the Year, recently said, "[Marin Alsop] connects to the public as few conductors today can." In 2005, Marin Alsop was named a MacArthur Fellow, the first and only conductor ever to receive this most prestigious American award. In the same year, Alsop won the Classical Brit Award for Best Female Artist. She was also the first artist to win Gramophone's "Artist of the Year" award and the Royal Philharmonic Society's Conductor's Award in the same year (2003). When she was awarded the Royal Philharmonic Society's BBC Radio 3 Listeners Award in 2006, Radio 3 voters called her "a breath of fresh air in the music world," "a fantastic, charismatic conductor" and praised her "boundless enthusiasm." In 2007, she was honored with a European Women of Achievement Award, presented to individuals whose vision, courage and determination have made a major impact on increasing the influence of women on European affairs. In 2008, Marin Alsop was inducted as a fellow into the American Academy of Arts and Sciences. In November 2010, she was inducted into the Classical Music Hall of Fame. 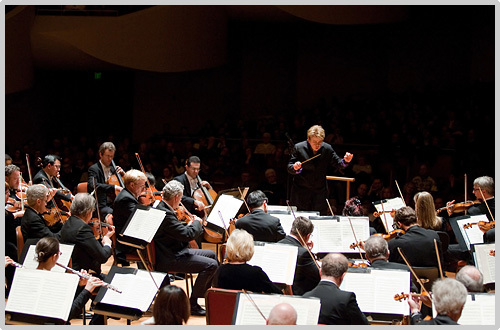 In February 2011, Marin Alsop was named the music director of the Orquestra Sinfônica do estado de São Paulo (OSESP), or the São Paulo Symphony Orchestra, effective in the 2012-13 season. Ms. Alsop was named to Guardian's Top 100 Women list in March 2011. This spring Marin Alsop was named an Artist in Residence at the Southbank Centre in London, England. Marin Alsop makes regular guest conducting appearances with the New York Philharmonic, The Philadelphia Orchestra and the Los Angeles Philharmonic. She frequently conducts abroad at such venues as Royal Concertgebouw Orchestra, Zurich Tonhalle, Orchestre de Paris, Munich Philharmonic and La Scala Milan, and she is one of the few conductors to perform every season with both the London Symphony Orchestra and the London Philharmonic. She served as artistic director of London's Southbank Centre's The Bernstein Project, which ran from September 2009 to July 2010 and featured a range of musical selections from Mozart with the Orchestra of the Age of Enlightenment to Bernstein's own Mass, featuring musicians from the National Youth Orchestra and a huge cast of performers drawn from the local community. In September 2006, she led the American premiere of Nicholas Maw's opera, Sophie's Choice, at the Washington National Opera. She made her opera-conducting debut in 2004 with the Opera Theater of St. Louis conducting John Adams's Nixon in China. Also in 2004, she conducted a fully staged production of Bernstein's Candide with the New York Philharmonic, a production that was nominated for an Emmy Award in 2005. Maestra Alsop continues her association as conductor laureate of the Colorado Symphony following her highly successful 12-year tenure as music director; she also continues in her 19th season as music director of the acclaimed Cabrillo Festival of Contemporary Music in California. In addition, she has held the position of principal guest conductor with both the City of London Sinfonia and the Royal Scottish National Orchestra, with whom she made numerous critically acclaimed recordings. 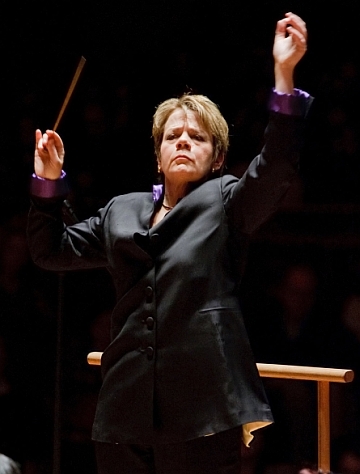 In 2008, Marin Alsop led the BSO and nearly 250 performers in performances of Leonard Bernstein's Mass: A Theatre Piece for Singers, Players and Dancers at Baltimore's Joseph Meyerhoff Symphony Hall and The John F. Kennedy Center for the Performing Arts in Washington, D.C. She also led Mass at New York City's Carnegie Hall as a highlight of its citywide festival, Bernstein: The Best of All Possible Worlds, and as part of The Weill Music Institute at Carnegie Hall's Bernstein Mass Project, at the United Palace Theater in Upper Manhattan where approximately 500 New York City public school children sang in the chorus of Mass alongside the BSO. The work was recorded on the Naxos label and nominated for a 2009 Grammy Award in the Best Classical Album category. 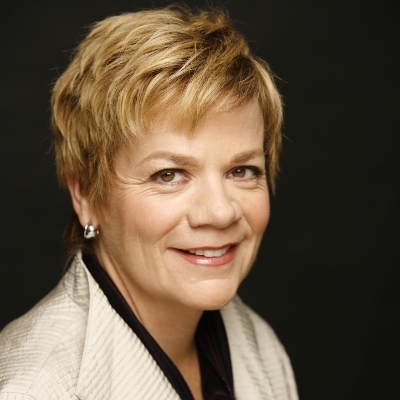 Marin Alsop has led Baltimore Symphony Orchestra in several key outreach initiatives. In 2008, she partnered with the BSO to launch OrchKids, a music education and life enrichment program for youth in West Baltimore. In 2010, she conducted the first "Rusty Musicians with the BSO" - an event that gave local orchestral players the chance to perform onstage with a professional symphony orchestra and quickly became a popular component of the BSO's efforts to connect with the community. In June 2010, Maestra Alsop conducted the inaugural BSO Academy - an immersive summer music program that gives approximately 100 amateur adult musicians the opportunity to perform alongside a top professional orchestra. One of Maestra Alsop's first projects as music director of the BSO was a Dvořák symphonic cycle, recorded on the Naxos label. The first disk in the series, featuring Symphony No. 9, "From the New World," and Symphonic Variations, was released in February 2008. Of this release, BBC Music Magazine said, "It is rare to be able to say that a performance forces one to listen to a work anew, but this is exactly what Alsop's reading achieves." The disk was also nominated for BBC Music Magazine's 2008 Album of the Year. Symphonies Nos. 7 and 8 were released in June 2010. In May 2011, a recording of Mahler's First Symphony with the BSO led by Maestra Alsop will be released on the Naxos label. In June 2006, during her tenure as music director designate of the BSO, she led the Orchestra and violinist Joshua Bell in John Corigliano's Concerto for Violin and Orchestra, "The Red Violin," recorded by Sony Classics and released in September 2007. Also in her designate term, she conducted the Orchestra in Stravinsky's The Rite of Spring, an acclaimed performance that became the Orchestra's first-ever live-recording release on iTunes and quickly became the number one classical download. Other highlights of Maestra Alsop's acclaimed recording collaboration with Naxos include a Brahms symphony cycle with the London Philharmonic Orchestra and an ongoing series of Bournemouth Symphony recordings, which include Bartók's Miraculous Mandarin, Bernstein's Chichester Psalms and the symphonies of Kurt Weill. In addition to her orchestral recordings, she can also be heard regularly as a commentator on NPR's Weekend Edition program "Marin on Music" and on BBC's Radio 3. In 2006, she was the only classical musician invited to attend the annual meeting of the World Economic Forum in Davos, Switzerland, alongside presidents, prime ministers and CEOs of the world's most powerful companies. She has been profiled in Time and Newsweek, appeared on NBC's "Today Show" and was featured as ABC News' "Person of the Week" in 2005. A native of New York City, Marin Alsop attended Yale University and received her master's degree from The Juilliard School. In 1989, her conducting career was launched when she was a prizewinner at the Leopold Stokowski International Conducting Competition in New York, and in the same year was awarded the Koussevitzky Conducting Prize at the Tanglewood Music Center. This interview was recorded backstage at the Ravinia Festival in Highland Park, IL, on June 19, 2003. Portions were used (with recordings) on WNUR two days later. The transcription was made and posted on this website in 2012.